The A1 highway is the most frequented in Europe, taken by nearly 100,000 vehicles every day: a constant, dense and dangerous flow! Accidents, chasing reckless drivers and people smugglers, endless jams and bad weather are the everyday lot of the men and women who work on the A1. Breakdown operators, lane markers and gendarmes know very well that the least little incident can quickly turn into crisis. 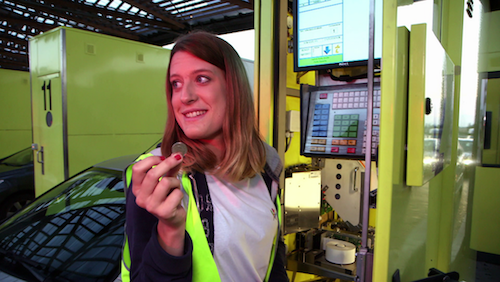 Céline, 27, is a truck driver, with a well-tempered personality of. One of the few women in a very masculine job. At the wheel of her pink and white truck, she drives up and down the A1 from Monday to Friday to deliver her goods and then she spends the night in a parking lot in her heavy goods truck. This passionate lover of heavy machines will soon have to make a major decision: continue a travelling life on the highway or start a family. The people who know every little corner of the highway are the patrolmen, “the guardian angels of the blacktop”. Every day, Frédéric, 51, risks his life keeping the A1 safe. Especially when he has to walk out in the middle of the traffic, dodging between the cars and the trucks, to pick up bits of debris. Christophe, 50, is head of the extraordinary logistics operation on the A1. Whether shutting down traffic totally in the middle of the night to carry out emergency works after an accident, or making sure snowfall doesn’t create chaos, Christophe is in action on all fronts! At 30, Pierre already heads a squad of gendarmes on the A1. The young lieutenant chases down reckless drivers and is often the first to provide assistance to the victims of accidents. Pierre and his men are also conducting a merciless fight against an ever-increasing menace on the A1 Highway: human trafficking between France and England. In his sights are the smugglers who organize the migrant trade. Manuel, 55, is a breakdown man with a big heart. He’s always on his toes to assist motorists in trouble. Day and night, including weekends, Manuel drives up and down the blacktop… a situation that is not always easy for his wife. From the massive migration of summer with its vacation rush to the snow storms that, this year, brought the whole of the Ile de France to a standstill, the teams from Zone Interdite spent a whole year filming in the thick of the action on this monster stretch of blacktop to bring you the secrets and the behind-the-scenes life on the A1 Highway.